little more frequent.) Just tonight, Analise is spending the night at her grandparents, and I overheard Josiah playing with the little bears and people all lined up on the bookshelf. He said, "Wha matter, Do-a? Wha matter?" And then later, "Where’s Do-a?" When I brought Dora up to the party, he said, "There you are!" Which is so comical, because he says, "There you are!" to any where question. For example, Where’s Josiah? "There you are!" Maybe because we say, "There you are!" Or Where’s my belly button? "There you are!" When a movie ends, like tonight in the car as we were picking up Brian, he’ll say, "Staht it!" I’m working on adding "please" to this phrase. "Yeaaah!" and "Oooooo yeaaahhh!" He’s so responsive with these, too. excited, and when he gets the cheese, he’ll say, "Oooooo yeahhhh". Analise is doing a lot of letter recognition, so we’re often spelling things, talking about letters, pointing letters out. Josiah loves to spout out his letters, "S-T-M-A-A-A" (We hear a lot of A’s because that’s Analise’s favorite letter, of course because it’s the most important in her name.) He can very nearly spell her name, too, which goes something like this: "A-S-E-L-A!" He’s also picking up counting very quickly. He prefers the even numbers, though. When I start counting something for Analise, like bites of food she’s to take until she’s done, I’ll say, "One…" and he’ll chime in, "Toooo". When we say 3, he’ll say, "Fo. Five, "Si", Seven, "Eh", Nine, "Te!" I know there are more, but I’ve had this blog open all day, so I’d better post it before it gets saved and forgotten 🙂 I’ll have to come back with some more. She can always make me laugh! Analise is such a chatterbox. She’s always got something to say, and sometimes I just wonder where it all comes from! This morning, she hurt her finger playing and came crying to me. I washed it off and suggested a band-aid. The last time she had a band-aid was after 3-days of antibiotic shots for an ear infection last January. It was traumatizing. I think band-aids remind her of that, and to top it off, taking the band-aids off was painful enough that she doesn’t associate band-aids with any kind of feeling better. So of course, when I suggested that a band-aid would keep her cut clean and make it feel better, she didn’t believe me and cried even harder. She just preferred to hold her wound, keeping it covered with her hand. As I put her in the car to take her to school, she told me she didn’t think she could play because she needed to hold her boo-boo. I told her, "Miss Brenda is going to ask why your Mommy didn’t put a band-aid on it. What are you going to tell her?" "I’ll tell her the boo-boo didn’t want a band-aid." "But wait… I just heard the boo-boo say it needed a band-aid to keep it covered." Analise in a high squeaky voice, making her hand talk, "No, no! I don’t want a band-aid! I’m fine!" Then when we got to school, the school "principal", Miss June, opened the door to get Analise out and said, "Good morning!" Analise didn’t say anything. Miss June said, "You’re not going to talk to me this morning?" Analise said, "Shhh… my boo-boo is sleeping!" Miss June got her out of the car and said, "I hope your boo-boo feels better." And as Analise sauntered in to school, I heard her say, "It’ll feel better when I grow up." What happens when Mom’s had it? I had dinner all planned out. Brian was going to be gone for a weekly training ride. But as I was cleaning up the kitchen to start dinner, the drain started backing up on one side of the sink, and when I rain the disposal, it came up the other side. ARG. I tried to plunge it but splattered junk all over. Brian came rushing in bc he’d had a bike problem he needed to fix and wanted to fill his water bottle. I was looking for something in the cupboards under the bar area of the kitchen, and came up to CRACK my head really hard on the corner of the counter. OUCH. It was the final straw and I broke into tears. Analise HATES to see me cry. I scrapped dinner plans, loaded A& J into the car for a $5 Little Caesar’s Hot & Ready Pizza and breadsticks. We spread out a blanket in the driveway and had a picnic. The kids played outside for an hour and a half until it got too chilly as the sun was setting, and I cleaned out the car. Whew… am I glad the evening turned around! The house is still a mess as we’re unpacking from a whirlwind trip to Indiana for Easter with my family. It was a nice visit, but way too short with family (um, 36 hours including sleeping) and way too long in the car (24 hours!!!). Brian is amazing for driving nearly the whole trip, largely at night, and the kids were troopers to be tied into their seats for so long. We’re so lucky to have such good travelers! Ok, enough rambling. I’ve got to get the kitchen cleaned up so it’s ready for all that tomorrow has to offer. 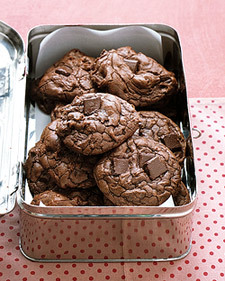 Courtesy of Martha Stewart… these cookies live up to their name!! ***My notes: 1- I used chocolate chips to melt, and then let the melted mixture cool a bit before adding it to the batter. 2- I mixed the egg/sugar/vanilla mixture for quite a while, maybe 4 min? and it definitely got lighter, though not so "fluffy". After adding everything, the batter still seemed runny, so I added an additional 1/3 c or so of flour, and chilled the mixture for 15 min before dropping it onto the pan. They were PERFECT. Very much like little brownie cookies! Final haircut pictures and eggs! Humor me, as I watch my baby boy grow up 🙂 He’s so cute… I love his new haircut and all the soft neck I have to snuggle when we’re reading and I’m carrying him to bed. Analise and I colored eggs this afternoon, while Josiah played with a couple bowls of water and some plastic eggs. Oh, and a granola bar. That’s what he had the most fun with in the water. He dissolved it into little grain pieces, and called, "Mo water!" We started out with a pretty swirly coloring kit, but it didn’t work well. Analise was more than happy to use her watercolors and paint away. So glad she doesn’t need much crafting extravagance to keep her happy! She was so serious, she spared me one tiny smile as I tried to duly document the memories… Oh, and you can see that her hair is quite a bit shorter (maybe 3 inches), but it’s kind of scraggly because this was right after naptime. (which are only there when his hair has been wet), and his soft, clean baby neck. I’ll post a picture tomorrow of my handsome little man. He looks like such a big boy! Very clean cut! I made my first loaf of bread today! Well, technically not first, since I make Tastefully Simple’s Bountiful Beer Bread all the time (I sell it, by the way!!). It’s delicious. But I’ve had this bread machine sitting in my cupboard, and it only gets used for pizza dough. I saw this great recipe online, and thought it looked easy enough, and I’m craving carbs, so I tackled it as today’s adventure. I thought bread-making was a bit of an exact science, but I guess not… I didn’t have 1 full T of yeast, more like 2/3. But it rose well, and it tastes FABULOUS. Super easy! Dump it all in my bread machine, turn on the 1.5hr dough cycle, take it out, form it into a loaf, put it in a greased pan, let it rise (on top of my oven, set at the lowest heat) for 45 min or so, and bake for 32 min. Oooo man, I love me some homemade bread. This is going to be a regular happening in the Toone house! care. When did I get to be like that? Musketeers MINT bar, gotten it open, and started chowing down Little bugger. 75cents of my coupon savings down the drain So by the time we got to the car, he’s got chocolate everywhere. My little chocolate covered rugrat. are torn off 5 muffins, before he decided on the one he picked. Silly boy. And now they’re all contaminated from his snotty hands. the root. She was pretty good. We actually have a regular dentist appointment for a cleaning and checkup in April, so hopefully nothing happens between now and then. frantic at the thought of seeing the dentist, so we’ll go tomorrow. seeping blood around the top an hour later. I hope she’s not following in the footsteps of her Daddy whose front 2 teeth are both capped.